In the 78 minutes Collins and Kanter have played together since Kanter joined the team, the Blazers are scoring 118 points per 100 possessions and allowing only 100. Those are elite numbers. Davis signed with the Brooklyn Nets in the offseason, and for the first 57 games of the season, Meyers Leonard absorbed most of his minutes for the Blazers. Collins and Leonard wasn't as effective a combination, though. The two still logged plenty of minutes together, but in the 506 minutes they shared the court, the Blazers have been outscored by 0.7 points per 100 possessions. The offense, in particular, has been anemic with Collins and Leonard on the court, scoring just 104.4 points per 100 possessions. The Trail Blazers signed Enes Kanter on February 14 and he replaced Leonard in the Blazers’ reserve unit. Though Kanter has been effective, averaging 10.0 points and 6.7 rebounds in 18.3 minutes per game (compared to Leonard, who averaged 5.8 points and 3.7 rebounds in 14.2 minutes per game), lineups featuring Kanter have mostly been terrible. The two five-man lineups Kanter has played the most with since joining the team have been outscored by 32.4 points per 100 possessions (CJ McCollum, Seth Curry, Rodney Hood, Jake Layman, Kanter) and 11.2 points per 100 (Damian Lillard, Curry, Hood, Layman, Kanter). That's not good. Stotts, however, has found success with at least one five-man lineup featuring Kanter. A reserve unit featuring Seth Curry, Rodney Hood, Jake Layman, Zach Collins and Enes Kanter has outscored teams by 46.3 points per 100 possessions. A similar, less-used lineup of Evan Turner, Curry, McCollum, Collins and Kanter has outscored teams by 43.8 points per 100. The difference seems to be Collins. Everyone knows Kanter’s defense isn’t good. His defensive rating of 108.3 (which means the Blazers allow 108.3 points per 100 possessions when Kanter is on the court) is tied for the worst among Portland’s rotation players since he joined the Blazers. Collins, however, has the best defensive rating on the team since the All-Star break at 97.2. Pairing the defensively stout Collins with Kanter helps accentuate Kanter’s strengths (scoring and rebounding) while diminishing the negative impact of his defense. 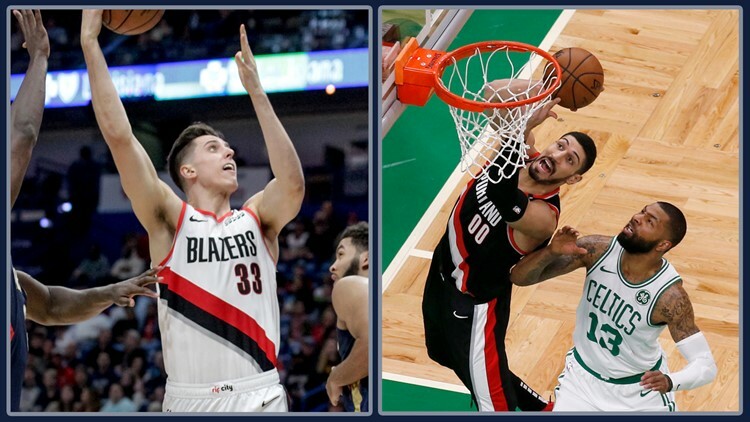 Portland Trail Blazers reserve big men Zach Collins, left, and Enes Kanter. After Monday’s win against the Pacers, Stotts was asked what he likes about the pairing of Collins and Kanter. Stotts is right about the lineup data. Collins and Kanter have played 78 minutes together since Kanter joined the team and in those stretches of play, the Blazers are scoring 118 points per 100 possessions and allowing only 100 points per 100. This pairing has been a recent development. Collins and Kanter have played 51 of those 78 minutes together over the past five games and in those 51 minutes, the Blazers have outscored teams by 28 points per 100 possessions, with an offensive rating of 121.5 and a defensive rating of 93.5. It's a relatively small sample size, but those are elite numbers. There has been justified concern about whether the Blazers can play Kanter in the playoffs, when teams can target Kanter on defense, especially in the pick-and-roll. If the Collins-Kanter pairing continues to be this effective, it seems Stotts has found a way around that concern, which bodes well for the Blazers’ playoff hopes.